The Museum presented its findings at a conference on Leonardo da Vinci at London’s National Gallery. The Prado said it realised the painting’s significance after the restoration revealed hidden layers, which were until then covered over with black paint and varnish. The painting features the same female figure and is thought to be the work of one of Leonardo’s students alongside the 16th century original. 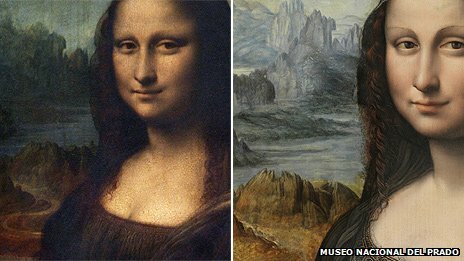 Dozens of Mona Lisa replicas remain, which were made during the 16th and 17th centuries, when copying famous artworks was a flourishing business. Experts thought this replica was painted long after Leonardo’s death because it remained hidden for so long under the overpaint. However after using x-rays to analyse the original drawings underneath those layers, conservators have concluded that this painting was realised at the same time as Leonardo’s original. The discovery of the painting at The Prado was reported by the Art Newspaper, saying that the “sensational find will transform our understanding of the world’s most famous picture”. The removal of the black paint on the replica has revealed “the fine details of the delicate Tuscan landscape” which mirrors the background of Leonardo’s masterpiece, added the Art Newspaper. Leonardo’s Mona Lisa currently hangs at the Louvre in Paris. However unlike this replica it is obscured by several layers of old, cracked varnish, and cleaning and restoration is thought to be too risky because the painting is fragile. The discovery has even induced experts to believe that the woman who sat for the Renaissance Masterpiece was in her early 20s, which means much younger that the Louvre’s original appears to show. In March, once the replica is completely restored, it will be exhibited at the Louvre so that visitors can compare the two paintings.